Head over to get this Double-Sided Art Easel on sale for $19.99 (Retail $59.99). Parents don't need to worry about cleaning up drawings on the walls. Kids love to paint, draw and write. 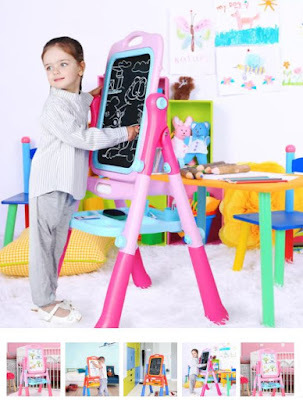 This Deluxe Double-Sided Art Easel will help develop your child's artistic skills. This Three-stage simple Tripod design is reinforced with 8 big screws. This magnetic double-sided Chalkboard/Whiteboard can be used by 2 children at the same time. It can flip up to 360 degrees. This easel includes a large storage tray that can store art supplies including storage cups plus painting clip. This is carefully designed and built with solid quality materials.